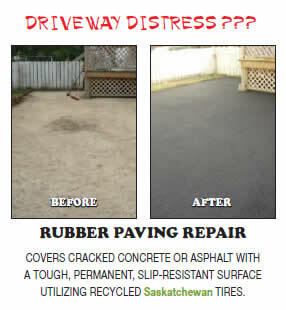 which utilizes recycled Saskatchewan tires. A cold mix of recycled tire crumb and resin, poured and rolled in place, cures in 24 hours to a durable protective surface, designed to last a lifetime. Your driveway, walk, or patio will look like new, with minimal maintenance. Now that’s NEW TECHnology at its finest!